The Bosphorus; not only does it form part of the continental boundary between Asia and Europe (separating the European side of Istanbul from the Asian side), it’s considered the heartbeat of the city. 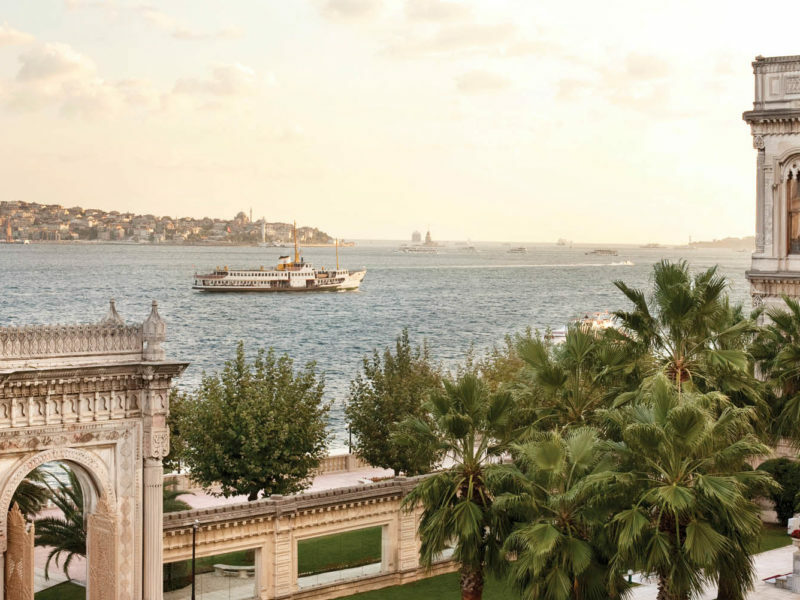 Forever a fan of its silver-tipped minarets, ancient bazaars and peerless hospitality, Dilvin Yasa makes her annual pilgrimage back to Istanbul and reckons it’s time we all follow suit. When I announced I was heading back to Istanbul a few months ago, my declaration invited its fair share of curious questions. Was it safe? Was I sure? Shouldn’t I perhaps consider somewhere less… volatile? They’re fair questions of course; Istanbul has been through a rough time in recent years, but I told them the same thing I’ll tell you now – it’s as safe and as dangerous as anywhere else. I’ll continue to go every year and while I’m at it, I’ll give you my ultimate Top 10 in the hope that you’ll one day join me. Whenever I’m in Istanbul, I check into a suite at a waterfront palace. It sounds wonderfully decadent I know, but in a city where former Ottoman palaces and grand residences are laughably commonplace, you can do exactly that without sounding like a tool. The best of the bunch is easily Çıraǧan Palace, an opulent 19th palace-turned-Kempinski property which walks a fine line between showcasing Turkey’s 19th-century architectural past and offering travellers all the mod-cons they should rightfully expect. Enjoy its pools, restaurants, spa and location, but most of all, enjoy saying, ‘my suite at the palace’. Picture a series of islands where there are no cars – only horses or bicycles. Where old Ottoman houses stand side by side to decadent beach clubs, and your only company is the cat (okay many cats) pestering you for a few drips of your cherry ice-cream. In a city filled with 15 million people and what is regularly voted the worst traffic in the world, The Princes’ Islands – only a quick ferry ride off the coast of Istanbul – can give you the peace and quiet you’ll occasionally crave. Unless you happen to love sandpaper on your skin and consider water-boarding a hobby (and who doesn’t? ), I don’t know that you’ll ever recover from your first Turkish bath (hamam) experience, but I know first-hand that once you’ve tried it, you’ll go back again and again. An ancient multi-stage bathing ritual that dates back to the 7th century, all the action takes place on a heated marble slab and although most hamams follow the same rituals, some of the best in town include Kiliç Ali Paşa Hamamı, Çemberlitaş Hamamı and Sanitas Spa at Çıraǧan Palace Kempinski. Like most Turks, I tend to avoid visiting the Grand Bazaar, deeming it to be too crowded, too over-priced, and too ‘Hey baby, where you go?’ catcall-y. Having said that, I recently went back after a 20-year hiatus and discovered the historic bazaar, which has been servicing this great city since the 1400s, all but empty. Prices are lower than low and sales people are so grateful to make any money that one vendor openly wept with relief when I purchased two jackets. It’s time to head back and spend, spend, spend. Don’t worry; security is tight. Have a spare $5? You can do no better than jumping on a Bosphorus Harbour tour, which departs from the chic waterside village of Ortakȍy (a 10-minute walk from Çıraǧan) and taking a one-hour tour of all of the palaces and ancient ruins that line the waterfront as though they were all purchased as part of a bulk lot online (seriously, how much history can one city have?) I personally like to spend my time plotting which of the pretty pastel waterfront mansions I’m going to one day squat in buy. Yes, we think, kebabs are great, but you know what’s even better? Tasting rich layers of history in everything we eat – an end result that can easily be achieved with the help of one golden rule: only ever order food (particularly street food) if the place in question has a long queue filled with locals hankering for a bite. I’m a sucker for a rooftop bar – particularly if said rooftop bar takes in views of sparkling waterway crammed with ancient palaces, towers and ruins – and happily, Istanbul is BIG on rooftop bars. You can eat at all of them but while I recommend a drink at 360Istanbul or Leb-i Derya for a cocktail, your first rooftop meal is best enjoyed at Mikla, where chef Mehmet Gűrs gives inventive Turkish dishes a quirky Scandinavian twist. The ‘influencers’ posing on every cobblestoned corner are enough to turn you off, but persevere; Istanbul’s most colourful suburb is also one of its oldest and ethnically diverse, and hidden gems can be found in every nook and cranny (often hiding behind flamboyant influencers). Located in the historic (and incredibly hilly) region of Fatih, you’ll need your walking shoes to tour adequately, but taking time to drink coffee and people watch will keep you feeling thirsty for more. I’ve been married to a Brit now for well over a decade, but I still can’t for the life of me understand the concept of putting milk in tea. Don’t even think about doing this in Turkey however – you’ll need to accept it the way it is: dark, strong and repetitive. “I love Istanbul so much I want to drop my pants and make love to her,” a waiter told me over lunch during my last visit. “I mean seriously, I could marry her – you know?” I know and now everyone else does too. Want passionate people who would love nothing more than to show you around their city and feed you endlessly? You can’t go past the hospitality of the Turks. My advice? Just don’t bring up soccer, politics, or how they feel about Istanbul. Please, just take my word for it.